Osomatsu-kun is an anime remake of the classic gag comic with the same name by Fujio Akatsuka. The leading character is a boy named Osomatsu, who is one of sextuplets. 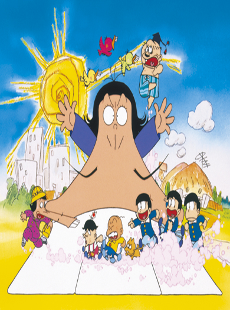 This zany comedy features such eccentric and over-the-top characters as bucktoothed French-styled Iymi, bald boy Chibita, big-pants Dekapan, self-absorbed cutie Totoko, and many others. Together they create many topsy-turvy confusions in the town.